Stereo/Surround 5.0; reviewed in surround. Notes in English, French, Italian and German. Giovanni Platti was an Italian composer born in Padua. He studied music probably in Venice, where his name is mentioned as a member of the Venetian artists' guild. He was accomplished on several instruments including the violin and oboe. He also seems to have made a speciality of the then new fangled fortepiano. His big break occurred in 1722 when he was appointed to the service of Count Johann Philipp Franz von Schönborn, Archbishop of Bamberg and Würzburg. After the Count died, the residency passed to, among others, Count Rudolf Franz Erwein who was an accomplished cellist. Platti stayed at this post, in various roles, until his death around 40 years later. He was quite productive, but it is thought that at least some of his work was destroyed in WWII when the archive of the huge Würzburg Residence, later called by Napoleon the largest parsonage in Europe, was bombed. He certainly composed concertos and sonatas for both his own instruments, violin and oboe, plus sonatas for keyboard, other concertante pieces, a Miserere, a Stabat Mater and probably oratorios. We know he composed twenty-eight cello concertos and a dozen cello sonatas in addition to the set of cello works from which this disc draws. He also joins the ranks of those several composers who arranged Corelli's Op.5 violin sonatas into a set of concerti grossi. These six Trio Sonatas are from a set of twenty he composed especially for his aristocratic player and are thus unusually scored not for two violins and continuo, but for one violin, one solo cello and continuo. The instrumentation used for this recording is therefore violin, cello, cello continuo, harpsichord and organ. This makes for a very rich and bass oriented sound. 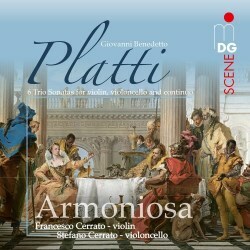 Platti was careful to make sure the noble cellist was never overshadowed by a more virtuoso violin line so this instrument does not stray far from the beaten track. MDG have chosen to record this group fairly closely and listeners will find they have to reduce the volume by around 4 or 5 dB to reach their usual level. Another consequence is that the spacious acoustic of the Konzerthaus der Abtei Marienmünster, so well utilised in the recent Franck and Ravel disc by Troussov and Troussova, also on MDG, is not so much in evidence here. More is the pity but the sound is perfectly acceptable. Armoniosa play in period style and are clearly very accomplished indeed. Platti is not of the front rank but displays the conventional inspirations of that period. Not for him the extravagance of Vivaldi or the profundity of Bach. His take on the Trio Sonata with a slow and grand first movement followed by either two or three other movements is nevertheless pleasing to hear. All but one trio on this disc follow the pattern slow-fast-slow-fast. The music seems to invite the listener to sit comfortably and not get too roused.